Tanks belonging to Yemeni Armed Forces Being Deployed Illegally to Al-Ahmars against the Houthis in Sa’ada current fighting. The current War in Sa’ada Governorate, Yemen, which started as a war between the followers of the people of Sa’ada led by the Zeidi leader Abdul-Malik Al-Houthi and the suspicious hard-line Wahhabi settlers in Dammaj, who are a hodgepodge of foreign and local Wahhabis gathered there to supposedly study the traditions of the Prophet Mohammed and seem to eventually settle there permanently (Some “students” have been there for 2 decaedes, which would make them candidates for two Ph.Ds at least. This is just another camp to train Al-Qaeda type terrorists to carry out attacks in Yemen and elsewhere, as many residents of Sa’ada continuously insist. The truth of the matter is that there are no libraries or archives in Dammaj for keeping the sayings and doings of the Prophet Mohammed, but rather there is a closed complex of terrorist training facilities, fortifications and tunnels used to make sure that no one enters the complex and to set out launching sites for expansion of the encampment to absorb other adjoining lands and houses taken from the indigenous people of Sa’ada. The methods used to establish these so called “Salafi” settlements remind one of how the Israeli kibbutzim were set up in Palestine, in the early days of the Zionist encroachment into the Holy Land. The religious school in Dammaj was set up with Saudi Arabian funding by the late Moqbil Al-Wadi’I, a hard-line Salafi “Imam” and teacher, who regarded all Shia’a Moslems as infidels, who deserve to be killed and looted of all their possessions. The indigenous population of Sa’ada are Zeidis, a small but enduring Moslem sect, which is more Sunni than it is Shi’ah, but nevertheless strongly despised by the Saudi Wahhabi religious establishment. About a year ago the Salafis in Dammaj started to attack neighboring villages of indigenous Sa’ada residents. The followers and supporters of the Wahhabi sect in Yemen (Salafis, Islah Party, Hashid Tribal leaders led by the offspring of the late Abdullah Bin Hussein Al-Ahmar, especially Hussein, not to mention some Yemeni military brass, led by General Ali Mohsen Al-Ahmar, former Commander of the First Armored Division and the Northwest Military Axis) all decided to advance the cause of these Dammaj settlers. The Dammaj settlers are recruited from Wahhabi schools throughout the world from Europe, Russia, Africa and other centers of Wahhabi nurturing. All these are in essence fighting a proxy war on behalf of the Saudis, who are staunch enemies of the Houthis, especially after the military setbacks of Saudi forces during the Sixth War of Sa’ada in 2011/2012, in which the Saudis directly involved their forces to create a buffer between the Saudi border and “push back the Houthis” ten kilometers, even if at the expense of destroying all the means of livelihood for the people of Sa’ada. The Saudis claim that Hizb-Allah of Lebanon and the Houthis represent a dangerous vice that could be used by Iran to crush Saudi Arabia. Realistically, however, the Houthis are far from enjoying the Iranian support given to Hizb-Allah. The Houthis seem to manage well with substantial quantities of military gear and ammunition taken from Yemeni and Saudi forces in the last war and the previous five wars waged against them by the regime of Ali Abdullah Saleh from 2004 to 2012. Many foreign settlers in Dammaj have been killed and many governments have warned their citizens from joining in a far away struggle that does not have anything to do with them. Although there is strong propaganda to try to picture the Zeidis of Yemen as “Shi’ahs” like the Iranians and Iraqis, the truth of the matter is that there are substantial differences. In either case, because of the Wahhabi inclination to regard anyone not belonging to their following as infidels, the Wahhabis regard the Zeidis as sanctified for the taking in terms of blood and belongings. In looking back at Islamic history, it is worth noting that despite the existence of some sectarian associations among Moslems, it goes without saying that followers of the different sectarian orientations have never waged wars between the different followers of Islamic sects, nor have any followers of Islam sanctified the blood of other Moslems of different sects, until the teachings of Mohammed Bin Abdul Wahhab were propagated about two and a half centuries from Najd, Saudi Arabia. The Ottomans put an end to Wahhabi assaults against people throughout Arabia, the Fertile Crescent and Pilgrims coming to Mecca and literally drove them and their Saudi leaders and Wahhabi clerics out of their stronghold in Dir’iya, a closed citadel of Wahhabi clerics and institutions, south of Riyadh, thus ending the First Saudi State. British intelligence rearmed the exiled Wahhabis, who had settled in Kuwait for almost a century, and sent them back to Nejd and the current Saudi regime became established in Riyadh. The Saud family and the Al Al-Sheikh clan (descendants of Mohammed Abdul Wahhab) jointly rule Saudi Arabia and share its abundant oil revenue wealth. The Saudi regime expended well over US $ 200 Billion to propagate the Wahhabi creed throughout the world and support extremist institutions and terrorist activities over the last forty years or so. This was done under various clandestine and covert operations, including “philanthropic and charity” organizations like the Moslem World League and Saudi intelligence or hired intelligence (Pakistani, Egyptian and other countries, including the Central Intelligence Agency, during the Afghani war against the Soviets). The Jihadist groups are given exaggerated credit for ending the occupation of Afghanistan, a feat, which really goes to the credit of the Azbuki fighters led by Ahmed Shah Masoud (killed by the Wahhabis on the eve of 9/11!) and General Abdul-Rashid Dustum) and other non-Wahhabi Jihadists, rather than the Jihadists of the Wahhabi genre. Saudi heavily financed propaganda helped to spread this misleading misreading of the Afghan War. Yemen also became a fertile ground for spreading Wahhabi culture and out of this propagation of Wahhabi inclinations, which began in the Seventies of the last century. came the Islah Party and several splinter Al-Qaeda groups (Ansar Al-Sharia’ah, Al-Qaeda of the Arabian Peninsula, etc.). The Saudis continue to strongly support these groups and all activities against the Houthis with substantial financial grants to some high ranking military and political officials “for opposing the Rejectionist Zeidis”. The Wahhabis call all Shi’ah followers as “Rejectionists of the followers of the Sunnah”. The Saudis continued to foment conflict in the area by prodding Salafis [settled in Dammaj and Kitaf (Northeast of Sa’ada)] to encroach upon Sa’ada residents near them and obviously this was bound to trigger a Houthi intervention to defend the Sa’ada residents, since the Yemeni Government refused or was unable to bring a halt to Salafi aggression and intimidation. The Saudis then recruited the Al-Ahmar family, led by Hameed Abdullah Al-Ahmar (billionaire businessman and warlord and the younger Hussein Al-Ahmar to join the fight with the Salafis. On the Government side, the Saudis prodded their high ranking military and political (Islah) officials to join the fight to save the “helpless peaceful families of Dammaj, who were facing a massacre” by the Houthis. The Houthis did not attempt to assault any of the two Salafi settlements, but rather besieged them to avoid any military supplies from reaching the two camps. But the Wahhabis worked night and day to picture the Dammaj residents as helpless unarmed “students” studying the traditions of the Prophet Mohammed and other corny manifestations of humanitarian sentiment. 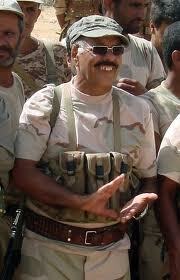 Hussein Al-Ahmar began to recruit tribal and non-tribal fighters to fight under his command against the Houthis. As the anti Houthi campaign got more military in nature and as the Al-Ahmar mercenaries imposed an indiscriminate siege against Sa’ada Governorate, and some of Amran Governorate, where there are Houthi followers, the Houthis decided to take the initiative and it was not long before the Houthis inflicted substantial defeats against the Salafis and the Al-Ahmar militias. The President of Yemen, Abdu-Rabbo Mansour Hadi set up a committee to disengage the fighters, which became activated every time the Houthis made critical advances against this hodgepodge mixture of mercenaries and misled military elements of the Islah Party. The Houthis responded favorably with every intermediation efforts. Once the Al-Ahmars and Salafis were able to cut loose and reinforce their positions, they went back again to their old aggressive activities, cutting roads and harassing and intimidating Sa’ada residents and Houthi followers wherever they found them. The Houthis finally took over the Kitaf Settlement and completely destroyed all the fortifications and tunnels built by the peaceful “students of Hadith, or Prophetic Traditions” and captured substantial arms and weapons, including homemade bombs and other ordnances used in terrorist attacks. The settlers were relocated by their Wahhabi supporters elsewhere in Yemen. When the Houthis finally attacked the Wadi Khaiwan fortifications built by the Al-Ahmars against them and cleaned all the valley from Ahmars and Wahhabis, the Al-Ahmars accepted a truce and not soon after that, reinforcements and weapons began to be rushed to the Al-Ahmars including tanks and armored vehicles illegally taken out of Yemeni military warehouses. 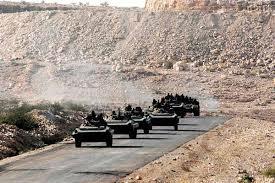 The heavy military hardware (at least 10 tanks, and 10 armored personnel carriers and other vehicles and military personnel were reported turned over to the Al-Ahmars and their allies). 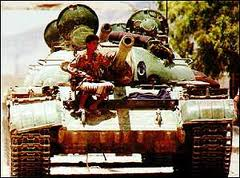 This could not have been consummated unless it was with the orders of General Ali Mohsen Al-Ahmar, long time backer of former President Ali Abdullah Saleh turned “dissenter” during the Yemeni peaceful revolution of 2011. The General (well beyond retirement age) still wields considerable influence in the military, despite having been removed from his former command positions. The latter is also giving orders to military commanders in Al-Jouf Governorate to facilitate and establish camps for Al-Qaeda and Salafi militants moved over from foreign Wahhabi centers, from Shabwa and other Southern Governorates. How long will the recent truce last will be rapidly determined by the disloyal efforts of the not so “dismissed” General and the Al-Ahmars to spread the conflict to other Governorates and involving more foreign and local mercenaries. The Saudis must be paying substantial amounts to fund this needless and senseless war, which is not doing any good for Yemen’s already very dismal and disorderly conditions in all political, military, administrative, economic and social fronts. With a weak government and a helpless President, brought to power by an almost useless Gulf Cooperation Council Initiative, there is no light yet at the end of the tunnel for the Yemeni people. With no power centers to rely on to back President Hadi’s positions or moves, it is impossible to picture what this political formula can achieve to bring Yemen out of its largely chaotic situation, while embezzlers, killers and blackmailers (most of who are holdovers from the Saleh regime) continue to sell their lucrative but destructive schemes to anyone here or overseas paying the highest price. Columnist, Political Analyst; knowledgeable on Middle East and Islamic Affairs; specialist on economic and financial affairs and development issues. This entry was posted in Arab Spring, Gulf Cooperation Council, Hizb-Allah, Religious Freedom in Yemen, Religious Fundamentalism, Saudi Interference, Terrorsim, Wahhabis, Wahhabism in Yemen, Yemen Peaceful Revolution, Yemen Politics and tagged Abdu Rabbo Mansour Hadi, Abdul-Malik Al-Houthi, Ahmed Ali Abdullah Saleh, Al-Ahmars, Arabian Peninsula, Common Sense, Dammaj, GCC Initiative, Hassan Al-Haifi, Houthis, Hussein Al-Ahmar, Imam, Islah Party, Kitaf, Ottoman Empire, Sa'ada, Salafis, Saudi and American Intervention in Yemen, Shi'ah, Wahhabis, Yemen Revolution, Zeidis. Bookmark the permalink. You are a liar. I was in Damaj. It is a place of learning, loved and cherished by many – especially those who seek to have the same faith as the Companions of the Messenger of Allah (saw) – not the creed of those who have innovated after those true believers (see Quran and Hadiths). With a name like Hernandez, if you were in Dammsj as you claim, you proved that Dammag was indeed adsettlement for foreign Wahhabis brought over to drive the indigenous population of Sa’ada from their homes and build Wahhabi settlements. That corny tale about the Prophet’s companions, you can try somewhere else, not here. Ehy don’t the Saudis allow you to build settlements in SA, where the companions roamed. How many “hadiths” did you find in Dammaj, if what you see is trueabout neing there, which id highly disputed? Who sponsored you from the Saudi Wahhabi Establishment? What were you doing thetr wiyh arms and materials for making explosives, etc? From January 2014 but valuable insight into the lead up to the current Saudi massacres in Yemen. Thank you Vanessa. You are always welcome to share or blog my mayerial. Thank YOU dear friend 🙂 for being a voice shouting out for Yemen. Much needed.